Our program is named after Fr. 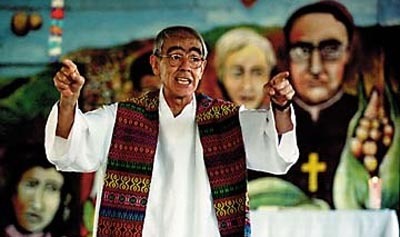 Jon Cortina, SJ, who worked with the people of Guarjila, El Salvador during and after the civil war. Father Jon de Cortina Garaigorta, SJ was born in Bilbao in the Basque region of Spain on December 8, 1934. He joined the Society of Jesus in 1954 and was sent to El Salvador in 1955. In 1968 he was ordained. Fr. Cortina survived the brutal Salvadoran Civil War from 1980 until 1992. On the night of November 16, 1989 six members of his Jesuit community, their housekeeper and her daughter were taken from their residence at the University of Central America and murdered on the front lawn. Fr. Cortina was not at the UCA that night. Instead he was in the war ravaged north, in the small village of Guarjila, among the people. Following the war, he founded Pro-Búsqueda in order to locate missing children from the war. The Salvadoran military abducted children during the war and then orchestrated legal adoptions for them in the United States, Europe and Latin America. The profit brought in from the sale of children helped finance the war effort. Pro-Búsqueda’s policy reconnected the children with their families but did not remove them from their adoptive homes. Hundreds of children were successfully identified and reconnected to their Salvadoran families. Fr. Cortina was a talented engineer; he worked for NASA and taught engineering at the University of Central America (UCA). He felt a tension; he found it challenging that he could send men to the moon but did not know how to build a house. It was this tension, at least in part, that drove him to use his engineering skills in Guarjila to build houses, bridges, and a system of aquaducts. He understood his own abilities could liberate others, and practiced what has been called “Liberation engineering”. Fr. Cortina understood that faith needs to have feet if it is to be transformative; that is, faith must also have an impact in people’s day to day life and be concerned with that which gives and takes away dignity. It is the call of people of faith to use their talents in a way that transforms the world; it is their call, in short, to be “liberation whatevers”. Participating in the work of liberation is not only transformative for others, it is above all a personal transformation. Free of dominant cultural languages of success, the self is free to to respond to the call of the community on one’s life. We were honored to have Fr. Cortina visit the Cortina Community floor (when it was located in McGloin Hall) before he died. Fr. Cortina suffered a stroke in Guatemala City, Guatemala and passed away on December 12, 2005. As we grow in understanding of our own faith in action, our own vocations, we find Fr. Cortina’s lived faith to be a guiding example in developing a well educated solidarity within our own community.